LEDs (Light Emitting Diodes) are two lead semi-conductor light sources that first appeared as electronic components in 1962. When activated, the LEDs electroluminescence emits light whose color is determined by the energy band gap of the semiconductor. That’s enough history and science for now! What all that means to a homeowner who has or wants outdoor lighting is that the ability and cost to change the color and look of the lighting around one’s home is easier and less expensive with LED lighting than using traditional bulbs. While LEDs cost more to buy per bulb, they may last as much as 50 times longer than ordinary lighting, which ultimately makes the bulbs less expensive. They are also more energy efficient, so the typical electricity cost to run LED lighting is lower as well. Overall payback time is usually 3-4 years. 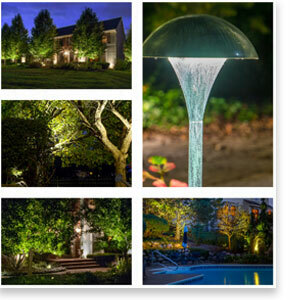 : Just like LED’s, remote controlling landscape lighting has evolved. While old style remotes just gave users the option to turn the system on and off, present day remote technology lets homeowners select from thousands of colors, different intensities, extensive zoning and dimming, all of which can be controlled over your Wi-Fi on smart devices or tablets. If you are not the ‘techie’ type, we can still offer you the on/off remote switching. Advances in LED technology coupled with fixtures that are engineered and designed to last longer have extended the typical life of a lighting fixture. Thanks to improvements in materials and resources that go into their manufacturing, many of today’s lighting products are much more durable than similar fixtures produced several years ago. 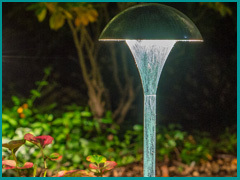 All of the topics above should be given consideration when selecting a new outdoor system, or changing the bulbs and/or fixtures that are in a current lighting scheme. With the options available to homeowners today, a new or improved outdoor lighting system will enhance the beauty and style of a residence and give its owners years of enjoyment. © 2016 Naturescape Design All Rights Reserved.